After tens years since the hip hop classic Train of Thought was released, the dynamic duo got together again for their sophomore LP Revolutions Per Minute. This rapper/producer duo present their fans and new listeners with its uplifting message which isn’t seen in hip hop now a days. Kweli’s conscious rhymes mixed with Hi-Tek’s versatile productions skills have made this collaboration one of the most anticipated hip hop albums of the year. 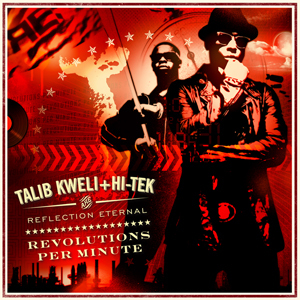 Revolutions Per Minute will feature SOB’s alumni Mos Def, Bun B, Jay Electronica and J. Cole. This album is a must cop so don’t waste any more time and go get it!! Talib is also performing @ SOB’s on 6/23. Tickets on sale now!!! !